The clustering paurotis palm forms a tropical oasis of slim trunks, fan leaves and a casual, "naturalized" Florida look. The paurotis is often called "Everglades Palm" because it's a native that grows there in dense stands. 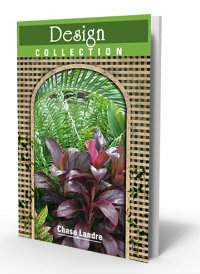 The tall, slender trunks retain leaf bases (called "boots") and fiber, for a soft crusted look that complements the bright green fan-shaped leaves. If this palm thins out - with fan leaves clustered only at the top - the look can be skimpy. Leave some suckers (young shoots) to fill in with leaves in at different heights. When kept well-trimmed, this is one palm that can look spectacular with nightime uplighting. 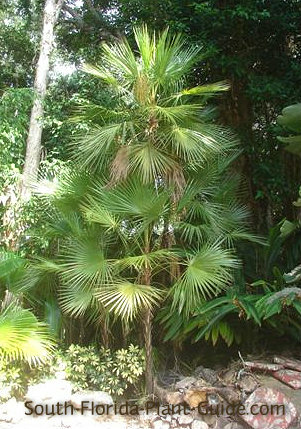 The paurotis is an easy-care palm, cold hardy throughout South Florida including Zone 9B. It grows slowly in sun to part shade, and can eventually reach a height of 25 feet. This moderately salt-tolerant palm spreads to form a large cluster, so plant in a spot where eventual spreading will be restricted (edged by sidewalk, patio, house). These are deer-resistant palms, though nothing is really deer-proof. No soil amendments are necessary for this palm. Even though these are native palms for South Florida, fertilization is necessary for the paurotis's health and good looks. Apply a good-quality granular palm fertilizer with micronutrients 3 times a year (spring, summer and autumn). Trim off browned fronds for a cleaner look. You can cut off emerging shoots at ground level to keep the palm's width in check, but leave some for a prettier, more ornamental look. You'd think a palm that grows wild in the Everglades could handle poorly drained soil and swampy conditions. Not the paurotis. In spite of what many sources may tell you, it needs well-drained soil, and though it's moderately drought-tolerant, it prefers a regular watering. Because this is a clustering palm with some height, you'll want to situate it 4 feet (or more) from the house to keep it away from eaves and roof lines. Along a fence, however, it can be planted as close as 3 feet out. If you're using paurotis palms for screening or to grow in a row, plant 3 or more feet apart. The paurotis is not a good choice for a container palm. COMPANION PLANT SUGGESTIONS: Plumbago, gold mound, snowbush, ligustrum sinensis, fountain grass, or other plants that form "clouds" around the palm's base.